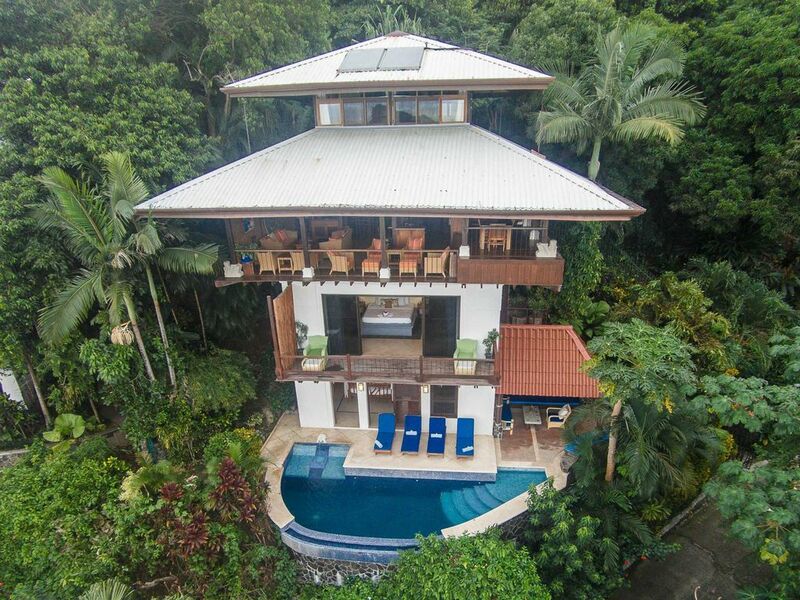 Casa Dolce Vita is perched high above the rainforest in Manuel Antonio, where the views of the Pacific are endless. The architecture of this villa emphasizes the natural surroundings with open-air living space and stunning views from all four floors and four bedrooms. Ideally located in a private neighborhood close to white sand beaches, the Manual Antonio National Park as well as spas, restaurants, and local markets. This villa design is inspired by the Balinese style of living. It is an inviting and peaceful space with quiet nooks to enjoy the scenery while enjoying a beach read. As well as comfortable gathering spaces for quality time with loved ones. The 8-seated raised dining area has the ocean and rainforest as a backdrop, creating a leisurely dining ambiance. The home stays cool from the ocean breezes and cathedral open beamed ceilings with ceiling fans. Local materials such as ceramics and bamboo are used throughout the villa, including custom built-in cabinets and handcrafted tiles. Casa Dolce Vita is a tropical retreat to delight the senses. Pacific Canyon Drive is a privately gated neighborhood set-off the main Manuel Antonio road. It is a community built by expats that wanted the comforts of modern luxury living within a tropical beach town. All conveniences and necessities are available by bus, taxi or walking distance. Please note: This villa is available to be rented as a 3 or 4 bedroom with varying rates respectively. This listing rate is for four bedrooms/8 people. You may find other listings for this home with different rates for different bedroom counts, but it is always private to just your group. Please inquire about specific rates for smaller or larger groups. You are well in walking distance of some great little restaurants in Manuel Antonio. Also, keep your eyes open for the little shops for souvenirs to take home. You have a truly amazing view of the Pacific Coast when you come to stay at the Casa Dolce Vita. You aren't far from the beach and you will also be able to see the Manuel Antonio national park. Maid services will do your personal laundry. There are courts in the area. Ask your host for details. There is a full 18-hole golf course at a 1 hour drive. Ask your host for details. This home is beautifully appointed and tastefully furnished. The views are amazing! The pool is perfect and peaceful. Do not leave anything (and I mean ANYTHING) laying around in the living room because the cutest monkeys will come in and take them away. Ricky was there to greet us and checked in to see if we needed anything. I hope to come back again and stay longer next time! Thank you for the great review and see you again soon. Our family had a wonderful stay at Casa Dolce Vita. The house was immaculate and spacious. We really enjoyed the open air atmosphere of the living room and kitchen. Capuchin monkeys came to visit us several times that week and there was a resident iguana who sunned itself by the pool each day. At night, one could hear Howler Monkeys communicating with each other and we saw them traversing between the trees. The views overlooking the pool and the ocean in the distance were quite beautiful. The housekeeper was very sweet and helpful. We are so glad you enjoyed your stay and the home. It was a pleasure hosting you. Property is amazing, great location extremely clean and well taken care of. Service was 5 star thank you Ricky WE WILL be back ! Hello Blake we are really glad to hear you and your group had a great stay with us at the Casa Dolce Vita. We hope you come back for future trips Dolce Vita or any other Villa you want to stay in will be waiting for you. All the best from everyone at Escape villas Costa Rica! Words cannot even describe the immense beauty of this place. If you have any interest in seeing all of the things Manuel Antonio has to offer (nature, wildlife, food), Casa Dolce Vita is THE place. We stayed with 7 adults and two young kids for a full week and are already counting the minutes until we can book again. From moment one, the hospitality and organization of the staff is just top notch. Our Chef, Stefan, was a completely necessary and luxurious addition to the trip. No hustling around at restaurants, eating at your own leisure, and his food was 1000% better than anything we got on the days we took breaks and ate in town. Every time we ventured out of the house, we wondered why we even left. Why deal with the crowds at the national park when you have sloths, monkeys toucans, and macaws from the comfort of your living room or pool. The monkeys that came to visit daily were an absolutely priceless addition to the experience. We even got in a mango throwing competition with one especially friendly group. I was super worried about the bugs, being the frequent bait for mosquitoes in my group. We came during the early part of the wet season and followed the instructions to leave the fans on and the lights low and it was never a problem. We even managed to rearrange the furniture and net the balcony railing to keep a newly-walking toddler safe in this beautiful tree house (although I wouldn't necessarily recommend if you are the anxious type with babies). This place is live changing. Just book it and don't look back. Our stay at Casa Dolca Vita was amazing. The views are incredible and the house was very clean and well-maintained. Definitely recommend it! A huge thank you to the escape villas team for a wonderful weekend at Casa Dolce Vita. Valerie was extremely helpful with booking our rafting trip and ensuring we had everything in order prior to our arrival!! Ricky was a perfect host and especially for stocking the fridge before we arrived!!! Chef Junior was beyond amazing - we asked for typical costa rican food and he didn’t disappoint. Each meal was delicious and the entire group was raving about it.